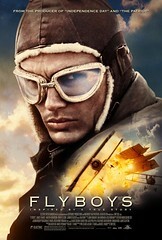 We have receieved a few premiere passes for the movie “Flyboy,” which invite you and a guest to a speicial advance screeming at the MEGAPLEX theaters at the Gateway at 7:00 pm Tuesday, Sep. 12th. Because the number of passes are very limited, you MUST email us to reserve a pass and come pick it up at the caffe. Passes will be released on a first-come, first-serve basis. Limist one (admit 2).